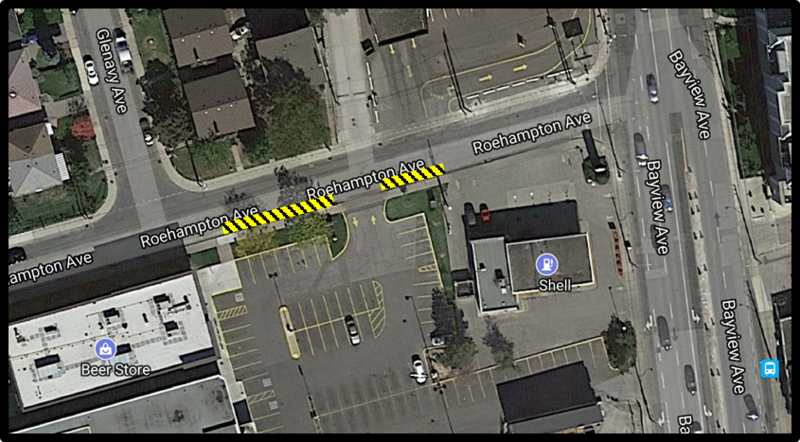 To facilitate shoring operations currently underway at Leaside Station, construction vehicles will periodically occupy the eastbound lane of Roehampton Avenue, west of Bayview Avenue. The lane will be used to accommodate temporary and periodic staging of trucks while other trucks are loading and offloading materials within existing construction zones. Truck staging will not block any driveways or entrances to businesses. Staging requirements will be revisited in late 2018 with the possibility of extension. The eastbound lane on Roehampton Avenue, west of Bayview Avenue will periodically be occupied by construction vehicles. Lane reductions will be in place; however, a minimum of one through lane will be maintained for each direction. No pedestrian impacts related to these works. View the permit for this work here.